We mow lawns in Cambridge, and we'd love to mow your lawn, too. We even offer same day lawn services if our scheduled permits.Just call Jim's Mowing in Cambridge on 1300 191 565 or you can book a lawn mowing job online for a time that suits to get your grass mowed or schedule a free, no obligation quote. Lawn Mowing prices can vary depending on the size, length and overall state of your lawn currently, so it is usually best for us to view the lawn first, to be able to give you an accurate estimate of the costs. We can also complete lawn edging, lawn fertilizing, irrigation & watering solutions, lawn aeration, weeding and so much more. Jim's Mowing Cambridge offer fully trained staff, who can advise you on all aspects of lawn care, including when to fertilize the lawns, how to promote strong root systems, how often to water lawns and when, through to aeration, recommendations on lawn feed, weeding and wetting agents best suited to your lawn. It is important that lawns are not damaged when mowed, and in particular they are not cut too short for the type of grass and the season, as this can result in grass dying off in patches. Our fully trained Mowing team know this, and so much more, so don't leave your lawn care to just anyone. Be assured that all Jim's Mowing staff are required to have a current police check, are all fully insured and fully trained. Plus, our work comes with a 100% money back guarantee. Remember, we also offer more than just expert lawn mowing services in Cambridge. Our services extend to entire garden maintenance, garden clean ups and rubbish removal, tree, shrub and hedging trimming and pruning, landscape design and hard landscaping services, gutter cleaning. 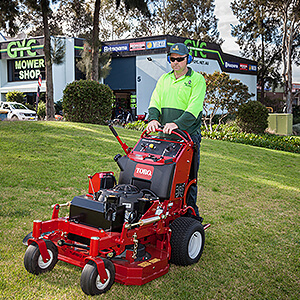 Call Jim's Lawn Mowing Services in Cambridge on 1300 191 565 now or book a Jim's online, today. Your lawn will be expertly mowed, all lawn clippings removed, giving you more time to enjoy your beautifully maintained lawn! So call Jim's Lawn Mowing now on 1300 191 565.